The city of Nelson is close to the centre of New Zealand. It lies at the shore of Tasman Bay, at the northern end of the South Island, and is the administrative centre of the Nelson region. 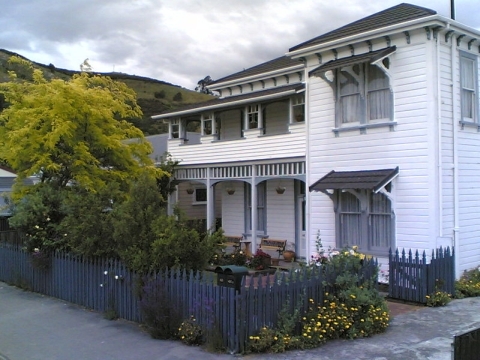 Nelson is a centre for arts and crafts, and each year hosts popular events such as the Nelson Arts Festival. The annual Wearable Art Awards began near Nelson and a museum, World of Wearable Art, is now housed close to Nelson Airport showcasing winning designs. Brightwater, near Nelson is the birthplace of Lord Rutherford, the Nobel Prize-winning physicist whose image appears on New Zealand's $100 banknote, the largest denomination in circulation in New Zealand. Nelson received its name in honour of the Admiral Horatio Nelson who defeated both the French and Spanish fleets at the Battle of Trafalgar in 1805. Many of the roads and public areas around the city are named after people and ships associated with that battle and Trafalgar Street is the main shopping axis of the city. Inhabitants of Nelson are referred to as Nelsonians. Nelson is one of the few New Zealand cities to have its own flag. 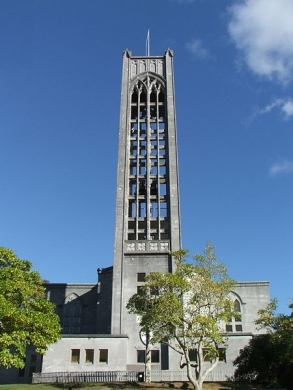 The Nelson Tasman or "Top of the South" region is administered as two unitary authorities by Nelson City Council and the (much larger in geographical area) adjoining Tasman District Council, headquartered in Richmond 15 kilometres to the south west. It is between Marlborough, another unitary authority, to the east, and the West Coast Regional Council to the west. 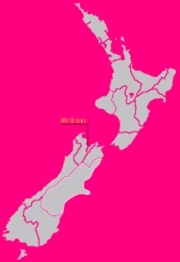 For some while, there has been talk about amalgamating the two authorities in order to streamline and render more financially economical the existing co-operation between the two councils, exemplified by similar action in the creation of Nelson Tasman Tourism,a jointly owned tourism promotion organisation. Nelson has beaches and a sheltered harbour. The harbour entrance is protected by a Boulder Bank, a natural, 13km bank of rocks transported south from Mackay Bluff via longshore drift. The bank creates a perfect natural harbour which enticed the first settlers although the entrance was narrow. The wreck of the Fifeshire on Arrow Rock (now sometimes called Fifeshire Rock in memory of this disaster) in 1842 proved the difficulty of the passage. A cut was later made in the bank in 1906 which allowed larger vessels access to the port. The creation of Rocks Road around the waterfront area after the Tahunanui slump in 1929 increased the effects of the tide on Nelson city's beach, Tahunanui, and removed sediment. This meant the popular beach and adjoining car park was being eroded (plus the sand dunes) so a project to replace these sands was put in place and has so far proved a success, with the sand rising a considerable amount and the dunes continuing to grow. 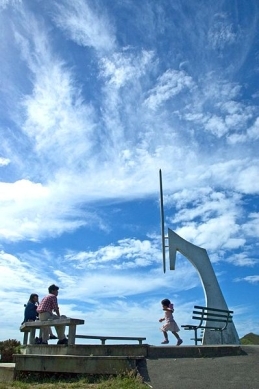 Many people believe Nelson has the best climate in New Zealand, as it regularly tops the national statistics for sunshine hours, with an annual average total of over 2400 hours. The geographical "Centre of New Zealand" allegedly lies in Nelson; on a hilltop near the centre of the city. However, this supposed "centre" was simply the convenient starting point for the original trigonometrical surveys of the South Island. The true geographical centre lies in a patch of unremarkable dense scrub in a forest in Spooners Range near Tapawera, 35 kilometres south-west of Nelson. 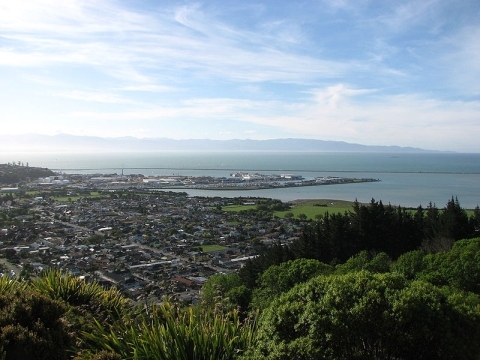 Settlement of Nelson began about 1100 years ago by Māori. There is evidence the earliest settlements in New Zealand are around the Nelson-Marlborough regions. The earliest recorded iwi in the Nelson district are the Ngāti Kuia, Ngati Tumatakokiri, Ngāti Apa and Rangitane tribes. to Richmond at the left. The New Zealand Company in London planned the settlement of Nelson. They intended to buy cheaply from the Māori some 200,000 acres (800 km²) which they planned to divide into one thousand lots and sell (at a considerable profit) to intending settlers. The Company earmarked future profits to finance the free passage of artisans and labourers and their families, and for the construction of public works. However by September 1841 only about one third of the lots had sold. Despite this the Colony pushed ahead. Three ships sailed from London under the command of Captain Arthur Wakefield. Arriving in New Zealand, they discovered that the new Governor of the colony, William Hobson would not give them a free hand to secure vast areas of land from the Maori or indeed to decide where to site the colony. 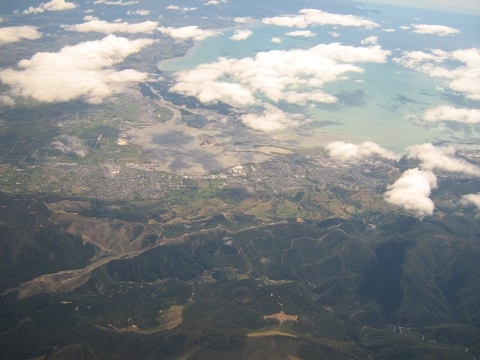 However, after some delay, Hobson allowed the Company to investigate the Tasman Bay area at the north end of the South Island. The Company selected the site now occupied by Nelson City because it had the best harbour in the area. But it had a major drawback: it lacked suitable arable land; Nelson City stands right on the edge of a mountain range while the nearby Waimea Plains amount to only about 60,000 acres (243 km²), less than one third of the area required by the Company plans. The Company secured a vague and undetermined area from the Māori for £800 that included Nelson, Waimea, Motueka, Riwaka and Whakapuaka. This allowed the settlement to begin, but the lack of definition would prove the source of much future conflict. The three colony ships sailed into Nelson Haven during the first week of November 1841. When the four first immigrant ships arrived three months later they found the town already laid out with streets, some wooden houses, tents and rough sheds. These ships were the Fifeshire, the Mary-Ann, the Lord Auckland and the Lloyds. Within 18 months the Company had sent out 18 ships with 1052 men, 872 women and 1384 children. However, fewer than ninety of the settlers had the capital to start as landowners. Notably, the early settlement of Nelson province included a proportion of German immigrants, who arrived on the ship Sankt Pauli and formed the nucleus of the villages of Sarau (Upper Moutere) and Neudorf. These were mostly Lutheran Protestants with a small number of Bavarian Catholics. After a brief initial period of prosperity, the lack of land and of capital caught up with the settlement and it entered a prolonged period of relative depression. Organised immigration ceased until the 1850s and the labourers had to accept a cut in their wages by a third. By the end of 1843 artisans and labourers began leaving Nelson and by 1846 some twenty five percent of the immigrants had moved away. The pressure to find more arable land became intense. To the south-east of Nelson lay the wide and fertile plains of the Wairau Valley. The New Zealand Company tried to claim that they had purchased the land. The Māori owners stated adamantly that the Wairau Valley had not formed part of the original land sale and made it clear they would resist any attempts by the settlers to occupy the area. The Nelson settlers led by Arthur Wakefield and Henry Thompson attempted to do just that. This resulted in the Wairau Affray, where 22 settlers died. The subsequent Government enquiry exonerated the Māori and found that the Nelson settlers had no legitimate claim to any land outside Tasman Bay.